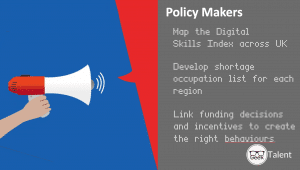 We were proud to present at the Digital Skills Summit which aimed to be more than just another talking shop – pleased to say we thought the pledges and the audience participation meant that we got to hear lots of views from all sides and a good mix of policy makers, educators and employers in the room. Thanks to Ty Goddard for hosting as usual giving a barnstorming performance and helping drive debate amongst the audience and panel guests. We presented the total number of live vacancies in the North East (3,318) along with the number of students studying from GCSE through to Degree level. There were some great comments from the audience who wanted to understand the jobs index further and let us know that we would be wary of basing long term decisions on a snap shot as this misses the seasonality of certain jobs for example. There was also discussion around how we can predict the future jobs Vs the jobs here and now. We did respond that we are simply trying to explain the here and now snapshot but that we could track on an on-going basis and that the number of apprenticeships and graduate jobs should be relatively high at this time of year. The last estimate on digital jobs in the North East was 2000 made by Dynamo 3 years ago – which means that the total job market and digital skills gap has actually worsened by 65% in that time. We presented several recommendations for Educators, Employers, Policy Makers, Inward Investment Teams. We would recommend a fairer representation of T-Levels (Technical Qualifications) at the top universities if we are to change the perception that A-Levels are the be all and end all for students, teachers and parents. Its fair to say that back in 2007 there has been a big change for Durham for example which was at 2% Technical Qualifications accepted. Our more controversial / up for debate target of 10% of every companies workforce should contain 10% of graduates or apprentice talent – this was debated on the panel but there for comments for and against this number. We as a company recruit predominantly graduate and apprentice talent – 2 x apprentices, 2 x graduates, 3 x experienced. We find that the graduates can hit the ground running and the apprentices need more support as you would expect but is very possible for our type of company. We have now provided the level of detail needed to help market to the actual types of people we really need in the North East and the impact of any future inward investment could be measured in real terms by the roles being recruited using the GoCareer Digital Jobs Index. When you look at skills across other regions we do find variations based on the unique company mix in the sector – this means that we will come up with a different shortage occupation list. If we are really going to drive the right behaviours in the education sector to come closer to the job market then we must have incentives or funding decisions directly related to how employable the courses are in that region. A very informative presentation which stimulated much debate on the day. 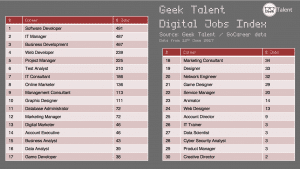 The digital jobs index was extremely interesting, not all jobs in the industry are computer scientists or programmers. Would be good to have this to support careers advisors with up-to-date information, bring new talent into the sector and stop it from ‘eating’ itself! Thanks Stefan – could this go on the labour market north east portal maybe which North Tyneside run which I know the National Careers Service advisors refer to. More than happy for this snapshot to go on there for wider use. It was interesting to see in your charts that ‘gamer’ jobs are fairly low on the scale of jobs in terms of actual number of vacancies. Shows perhaps that perception of what is available is far away from the reality of what’s really out there. Thanks Chris – Was great to hear from everyone on the panels and the audience also thank you for contributing and being part of the day. Lets push for the hours contributed to maximise the impact and get more young people opportunities in the sector – and to be able to name a few local companies too!